This was our third official celebration of Open That Bottle Night (OTBN) in conjunction with Wine Pairing Weekend (#winePW), a group of food and wine bloggers. We were a bit late to the party, given that Open That Bottle Night has been celebrated since 1999. That’s when then-Wall Street Journal wine columnists Dorothy J. Gaiter and John Brecher first established the event to encourage fellow wine lovers to open that special bottle of wine they’ve been holding in their cellar. Now, every year on the last Saturday in February, every wine lover has the perfect excuse to open that special bottle. We had just the wine for the occasion, one Pete has been wanting to open for several years, 1989 Château Léoville-Las Cases Grand Vin de Léoville du Marquis de Las Cases. Open That Bottle Night was extra special for us this year – for two reasons. First, the wine was just so darn delicious, probably one of the best in our cellar. But OTBN is not just about opening your best bottle of wine, it’s about opening a bottle that is special to you for some reason. The 1989 Grand Vin de Léoville du Marquis de Las Cases just happens to fit that description too. It is not every day, or even every year, that we have the opportunity to open a Second Growth Bordeaux (one of only 14 classified as Deuxièmes Crus) from a highly-regarded vintage. We’ve only opened such a special wine on one other occasion in the 20-odd years we have been drinking wine seriously. With the wine selection made, and friends invited for dinner, I began planning the menu. Our prior experience with red Bordeaux from the 1980s led us to expect an elegant wine that would require food choices that were not too spicy. We decided to start with a simple charcuterie plate along with mild, creamy cheese and olives. It’s our go-to for appetizers. Our friends prepared creamy cauliflower soup and brought a Bordeaux of their own. For the main course I reached for several recipes from the October 1995 issue of Bon Appétit magazine — Pork Tenderloin with Sautéed Onion and Fennel and Fennel Cream, Potato and Celery Root Purée and Chocolate-Hazelnut Mousse. They’re old favorites. Reliably delicious. Like Bordeaux, I suppose. Yes, we have an emotional connection to the wines from Bordeaux. It is one of the first wine regions we learned about when we began tasting wine seriously. Thanks to a local wine shop that specializes in red Bordeaux (and carries a few white Bordeaux, some Sauternes and Barsac as well), and features regular tastings of Bordeaux, we have tasted Bordeaux at many tastings over many vintages. Those wonderful flavors of primarily Cabernet Sauvignon became imprinted on our palates. We tasted these wines young, when they were bold and tannic, and we were encouraged to hold on to them. In this way we learned to enjoy the flavors of Bordeaux wines as they age. The focus of these tastings is never First Growth Bordeaux, those wines are way too expensive, but an occasional Second or Third Growth would sneak into the tastings along with the more common Fourth, Fifth and Cru Bourgeois-classified wines. The focus is always quality and affordability. Opening an Older Bottle of Wine. To Decant or Not? Several days ahead of time Pete carefully removed the Grand Vin from its side in our cellar and placed it in an upright position to allow any sediment to fall to the bottom of the bottle. When it came time to open the bottle he carefully cut the foil to reveal the cork. We took a look. The cork was dark in color; we desperately hoped it had not failed. Because the cork in an aged bottle of wine can become fragile, Pete always uses a 2-pronged cork puller and not a cork screw to open an older bottle of wine. Care must also be taken when using the cork puller not to push the cork into the bottle. It can be a delicate operation that Pete has found requires patience. Happily, he was able to remove the cork in one piece. We had a discussion about whether we should decant this wine ahead of time or not. If we did decide to decant, then for how long? We went back and forth on the issue and did some online research. Expert advice varies. Ultimately, we let our own experience be our guide and decided not to decant the wine ahead of time. More times than not, in our experience, an older Bordeaux is most expressive soon after being opened. We opened the wine just before our friends arrived and poured it into a decanter, only to be able to leave as much sediment as possible behind in the bottle. Why is this wine so special? First, the history of Château Léoville Las Cases in Saint-Julien dates back to the 17th Century. As you would expect the estate has changed hands over the centuries; it has expanded and contracted in size. The name has changed reflecting ownership changes over the years. Domaine de Léoville became Château Léoville Las Cases when it was purchased by the Las Cases family. This wine, Le Grand Vin de Léoville du Marquis de Las Casas, is sourced from grapes that comprise the historic heart of Château Léoville Las Cases vineyards — some of the very vineyard sites that produced the quality wine that earned the Château that Second Growth classification in 1855. Second, the vintage. 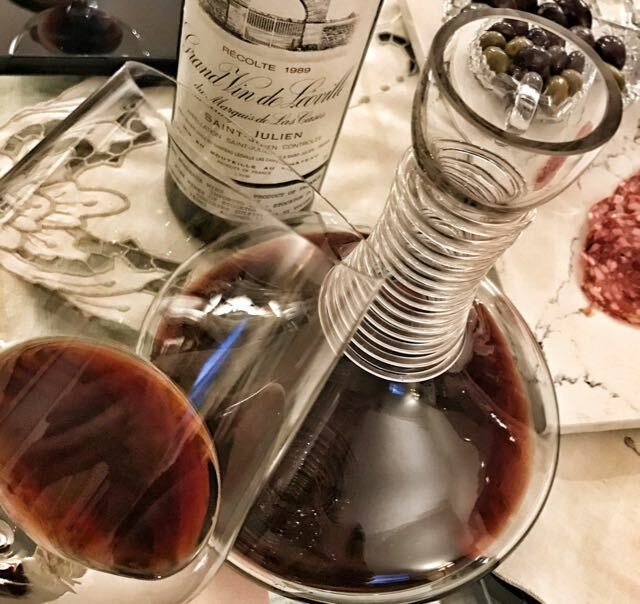 A mild winter led into a wet spring and the 1989 Bordeaux vintage was a warm one, the warmest since 1947, which resulted in an early harvest. 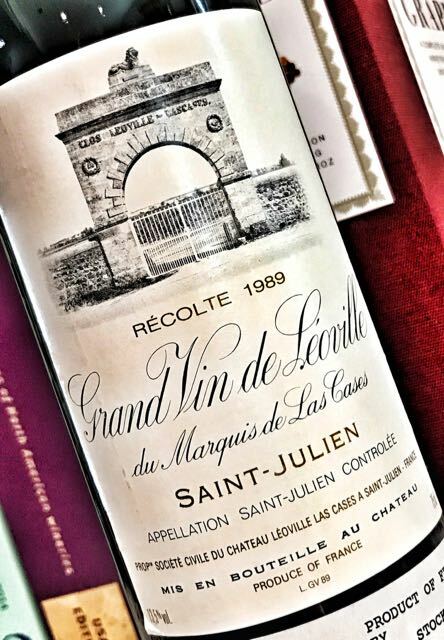 1989 is on every wine expert’s list of the best Bordeaux vintages. 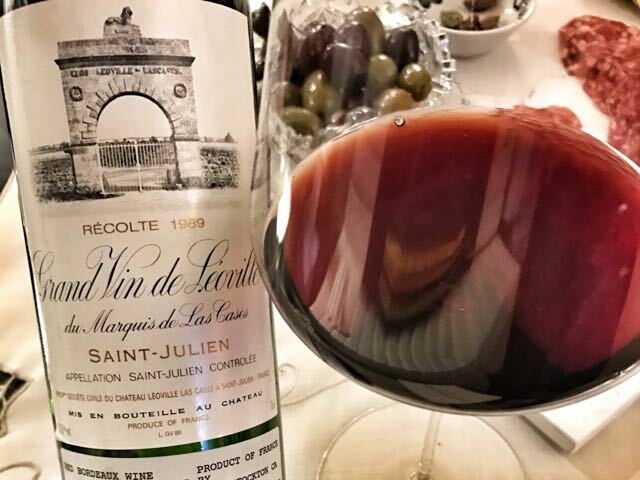 1989 Château Léoville Las Cases Grand Vin de Léoville du Marquis de Las Casas — medium garnet in the glass with generous red and dark fruit, leather and floral aromas. Complex and evolving flavors include dark berries and plums, leather and interesting backnotes of dried herbs and cedar. The body is light, tannins are smooth and the finish, which includes both flavor and tannins, is medium+ in length. 13.5% abv. Ethereal is the word Pete used to describe this wine. It is a spot-on description. For the complexity of flavor this wine provides it is surprisingly weightless in the mouth and the tannins are so soft. A surprising amount of fruit flavor remains. I wonder what this wine tasted like on release. The Léoville Las Cases Grand Vin was just lovely with our humble collection of Cowgirl Creamery Mt. Tam cheese, finocchiona and assorted olives. Truth be told, we finished most of the bottle before heading for the dinner table. At the table the Léoville Las Cases Grand Vin was a perfect pairing with the creamy cauliflower soup, pork tenderloin with creamy fennel and onions and potato and celery root purée. Even the roasted asparagus worked with the pairing. Delicious as the food was, the conversation always came back to the Léoville. By the time we moved back to the living room with the chocolate hazelnut mousse the Léoville was long gone, but definitely not forgotten. That lovely wine will remain in my memory for some time. Bordeaux wines may not be as fashionable as they once were, but we both have a great appreciation for them. I am very thankful for than initial introduction to Bordeaux and that we have gained an appreciation for aging them. It’s fine with me to not always be so fashionable! Please read on to learn about the special bottles of wine our fellow bloggers opened for their #OTBN celebration. It looks like a delicious collection. No blog post about #OTBN? No worries! You can still join the conversation about Open That Bottle Night Pairings by joining our live Twitter Chat on Saturday, March 11. Simply tune into the #winePW hashtag on Twitter at 8 a.m. Pacific Time on 3/11 and join the conversation. Please also make plans to join us for the April Wine Pairing Weekend event, when Wendy from A Day in the Life on the Farm will be hosting on the topic of “My Old Standby” on April 8. You can get a list of all the past and upcoming #winePW events by visiting the Wine Pairing Weekend page. I have to say i don’t know much about French wine and find it a little intimidating for whatever reason. Your description of the wines of the area though sound like something I would really enjoy. Sounds like you had a wonderful evening and the dishes sound wonderful! That is such an interesting comment, as I find many Italian regions/wines intimidating and I know you know them well. Wine is always an adventure, and I feel there is always much for me to learn. That’s part of the fun. Thanks for your comment, Jennifer. Sounds like it was a beautiful evening, Nancy! The menu looks delicious, too. I am totally in awe of your patience (and discipline) to leave that lovely bottle of wine in the cellar for so long! Thanks for sharing your evening with us. Thank you Lauren and thank you for your comments. Cheers! Great story! Thanks for sharing the recipe links (will try!) plus the back story of the wine and #WinePW #OTBN. I’ve celebrated #OTBN before but this is my first time with #WinePW. Cheers! Thank you, Gwendolyn. Wine and friends (and food) seems to be a natural pairing! Sounds like an amazing wine Nancy. I really enjoyed reading about your emotional connection to Bordeaux. It’s funny we started drinking Bordeaux when we first got into wine, but at that time found the examples we tried too tannic and “rustic”. I keep saying I need to circle back now that my palate has evolved. Thanks for sharing.. Thank you. I know exactly what you mean about tannic and rustic. I haven’t noticed rustic (barnyard) notes in the wines we’ve tasted in many vintages, but those substantial tannins are usually still present. Wine really is an enjoyable hobby! Thanks for your comments, Martin. Love this tannic and rustic comment thread! For me, my palate has evolved because I have had so many amazing tasting opportunities but also because my budget has improved! Well said, Gwendolyn! Experience and budget cannot be overlooked! Cheers. Great article, very informative. I am so impressed that you had this bottle for so long and I am awed by your knowledge on how to handle an older bottle. It was a very special bottle for sure. We have been very fortunate to have an excellent wine shop locally and friends who appreciate (and have taught us) how to care for and open older bottles of wine. Cheers, Wendy! That bottle definitely fits the bill for #OTBN. Having such an emotional connection to the region is wonderful. Having a local shop that specializes in Bordeaux must be fantastic! Opening that old of a bottle sure can be nerve racking. I love seeing the videos of when they open the bottles by heating to cut through the neck below the cork. Never seen in real life though- maybe some day. So true, we have been very fortunate in our wine experiences. Cheers, Lori!